This is a simple nut client for NetWare (NLM). I use it to shutdown my NetWare server in case of power failure. I have my UPS connected to a linux machine where Network UPS Tools are running. The UPS is connected to the linux machine. Upsd (and upsmon) is running on the linux machine. The NetWare client will connect to upsd and polls the ups status. In case upsd signals low Battery (or force shutdown), the NetWare server will shutdown. It can also be configured to shutdown the NetWare server if % battery goes below a certain vailue. The client (nutmon.nlm) will run on NetWare 4.11 to 6.50, i have it currently running on 5.1. In case you want to use NetWare 4.11, winsock has to be installed. A description on how to install winsock on NetWare 4.11 can be found on the latest support pack in \TOOLS\COREDUMP. To shutdown the server, nutmon uses the DownFileServer api. That api will do the shutdown but will not return to dos and allow APMPWOFF to power off the system. To do that, an additional command that is executed after DownFileServer is finished has to be specified in nutmon.ini. (commandAfterDown=) On netware 6.5 and 5.1 this command should be DOWN, on NetWare 4.11 EXIT. However, for testing communications with upsd, you can load nutmon into protected space. The download contains the pre compiled nlm, apmpwoff as well as the nutmon sources for FreePascal and the apmpwoff sources for turbo pascal 7. Before you ask, the nlm is so big because debug symbols are included. Most of the symbols will not be loaded into memory, they will be used to show a nice call trace in case of a failure. 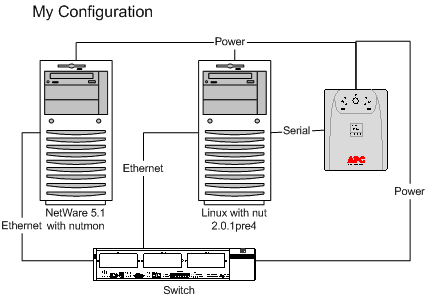 nutmon is free software distributed under the GNU General Public License. However, i would appreciate if you drop me a note in case you use this software (or not because it fails or is otherwise ususable for you ;-).